Walker & Company, 9780802717924, 242pp. In the following years following the Civil War, the 13th Amendment abolished slavery; the 14th conferred citizenship and equal protection under the law to white and black; and the 15th gave black American males the right to vote. In 1875, the most comprehensive civil rights legislation in the nation's history granted all Americans "the full and equal enjoyment" of public accomodations. Just eight years later, the Supreme Court, by an 8-1 vote, overturned the Civil Rights Act as unconstitutional and, in the process, disemboweled the equal protection provisions of the 14th Amendment. Using court records and accounts of the period, Lawrence Goldstone chronicles how "by the dawn of the 20th century the U.S. had become the nation of Jim Crow laws, quasi-slavery, and precisely the same two-tiered system of justice that had existed in the slave era." The very human story of how and why this happened make Inherently Unequal as important as it is provocative. 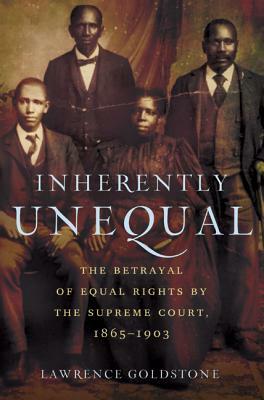 Examining both celebrated decisions like Plessy v. Ferguson and those often overlooked, Goldstone demonstrates how the Supreme Court turned a blind eye to the obvious reality of racism, defending instead the business establishment and status quo--thereby legalizing the brutal prejudice that came to definite the Jim Crow era. Lawrence Goldstone is the author of Dark Bargain: Slavery, Profits, and the Struggle for the Constitution, and The Activist: John Marshall, Marbury v. Madison, and the Myth of Judicial Review. He lives in Westport, Connecticut.